For a few years now there has been an online web page that listed the various VCDX holders around the world. What I can say is it was a great idea to have a place where everyone could be validated as holding a VCDX. As I joined the program, I saw that maintaining this page was very cumbersome and manual. Essentially anytime someone wanted their information updated, they emailed the changes and someone manually had to go update it. I’m not a fan of manual processes so I set out to get something created that had more scalability. 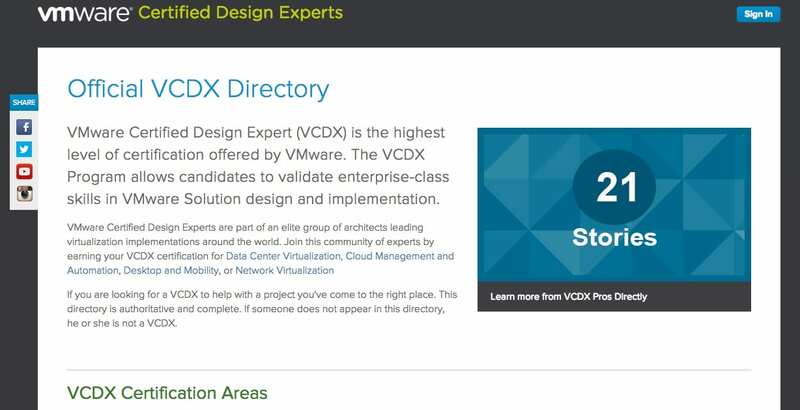 Here is what we ended up with located at VCDX.vmware.com! The other major upgrade is the ability to search for a VCDX by location, languages spoken, VCDX number, and other basic criteria. This is most useful for people searching for a VCDX, or better yet validating that someone is REALLY a VCDX. Don’t me going on some of the VCDX impersonations going on out there, but it does happen. 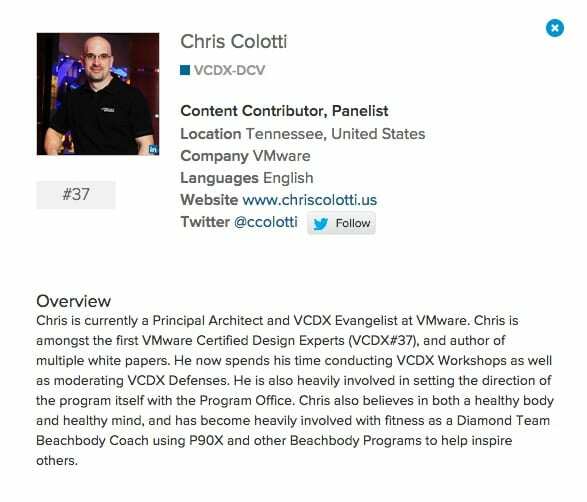 If someone is not listed here, they are NOT a VCDX. That being said not all users have activated their accounts and we are working on making sure they are activated so all holders show up even without full bio information. A note about the mentor filter. With the re-rollout of the Community Mentoring, the policy has always been that Panelists cannot be mentors. So if someone is tagged as a panelist then they will not be able to select themselves as a mentor. We are looking into revising the policy to allow for “Retired” panelists to become available as mentors, but until we finalize the policy any and all, past and present panelists are restricted. Lastly, a while back we re-launched the VCDX Community Mentoring and we were temporarily using a Google Sheet to track the Mentor volunteers. Now you can filter the directory for those that are mentors, and connect with them or anyone via Twitter, E-Mail, or Phone provided they have enabled that. Twitter is always available, but each user can enable the contact by phone or email individually. Finally, as part of the requirements we are hosting the site on vCloud Air going forward. It lives in a small vDC on a Dedicated Cloud. Eventually we will move it to vCloud Air OnDemand. At that time I will be sure to blog about the migration process and what it took to move it without downtime. The simple note here is we are using VMware technology to host the site and I believe there is even some data being collected about the virtual machine’s usage. We are already working on a list of small updates to the site and the old directory page will be removed and any short links updated to point to the new site. If you are a VCDX and you have not activated your account….please do so ASAP! 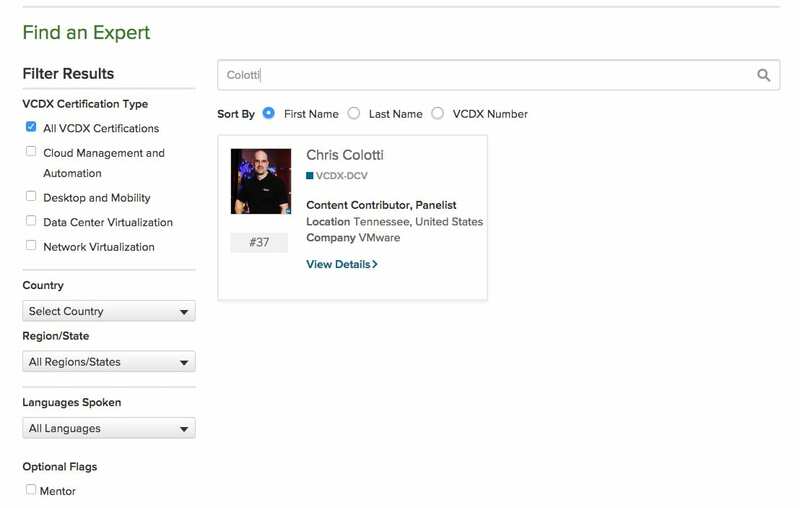 If you are looking to validate who is a VCDX, then the Official VCDX Directory is the place to look!